Is the Oxley Highway still the best riders’ road in Australia? In this issue of Australian Road Rider we pay homage to this amazing mountain road and tell you were you can stay and what to expect when you ride it. And as the depths of winter approach, we set out to see how far we can ride on the winter solstice, the shortest day of the year — with, er, mixed results. If your ambitions are a little more grand, how’s about riding all over Europe on your own bike? We show you how. This month we also tell you how you can learn to ride smoother, faster and safer, and in the second part of our adventure-touring guide we look at setting up your bike with the most suitable luggage systems. ARR’s reviews this month start with BMW’s brand new R1200GS Adventure, a machine that could be the best touring bike ever. 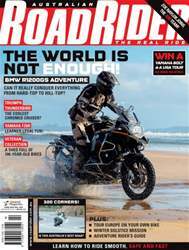 We also ride the learner-legal Yamaha FZ6R, Triumph’s glamorous 1600cc Thunderbird, and Piaggio’s just-right BV350. We also review two helmets and an automatic chain oiler.